When you switch from a tank-style water to a tankless water heater, you're doing the environment a favor -- but you're also helping out your bank account, because your power bills will go down too, whether your system runs off electricity or gas. You won't be paying to keep a tank of water hot around the clock; instead, you're just heating the water when you need it. Here are some tips to help you select your system so you can begin installation; Tankless Water Heater in Mesa, AZ systems take less space than their tank-style counterparts as well. While you're at the store, consider a condensing Tankless Water Heater in Mesa, AZ. You'll pay less on installation, and having the condensing technology makes your unit as much as 95 percent more efficient -- and the gas they give off for exhaust is often cooler. This means you can use polypropylene or PVC instead of metal for your exhaust pipe -- which is what makes the installation less expensive. If you choose a Tankless Water Heater in Mesa, AZ that has a concentric vent system, you'll make your home even safer. If you have a five-inch concentric vent, you have pipes for both outtake and intake, so your vent stays cool to the touch. Even if a pipe springs a leak, the air stays inside that vent rather than going into the home. A recess box lets your tankless unit fit inside your walls instead of sitting on the outside of your home. If you choose a non-condensing type, you'll have less efficiency, but you can also get a recess box offered from your home builder. The heater actually rests inside the framing of the home instead of hanging from the side of the house or taking up room inside. 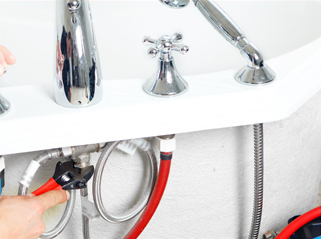 Put these tips to work as you consider the right tankless water heater for you and your family.